This archive holds all posts form December 12, 2009. With a small band of abolitionists, Brown had seized the federal arsenal there and freed slaves in the area. His plan was to flee with them to nearby mountains and provoke rebellions in the South. But he stalled too long in the arsenal and was captured. Brown’s group of antislavery band of attackers included whites, including relatives and three Jewish immigrants, and a number of blacks. (Photo: Wikipedia) Radical abolitionists constituted one of the first multiracial groups to struggle aggressively against systemic racism in US history. Brown reasonably saw the Appalachians, which stretch deep into the South, as an ideal base for a guerrilla war. He had studied the Maroon rebels of the West Indies, black fugitives who had used mountain camps to battle colonial powers on their islands. His plan was to create panic by arousing fears of a slave rebellion, leading Southerners to view slavery as dangerous and impractical. Ralph Waldo Emerson compared him to Jesus, declaring that Brown would “make the gallows as glorious as the cross.” Henry David Thoreau placed Brown above the freedom fighters of the American Revolution. 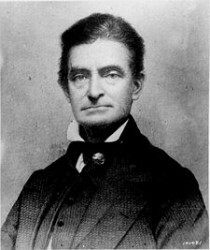 Frederick Douglass said that while he had lived for black people, John Brown had died for them. A later black reformer, W. E. B. Du Bois, called Brown the white American who had “come nearest to touching the real souls of black folk.” . . . . By the time of his hanging, John Brown was so respected in the North that bells tolled in many cities and towns in his honor. Lincoln was the Great Emancipator, but he shared the era’s racial prejudices, and even after the war started thought that blacks should be shipped out of the country once they were freed. Andrew Jackson was the man of his age, but in addition to being a slaveholder, he has the extra infamy of his callous treatment of Native Americans, for which some hold him guilty of genocide. A presidential pardon, however, would be more meaningful. Posthumous pardons are by definition symbolic. They’re intended to remove stigma or correct injustice. While the president cannot grant pardons for state crimes, a strong argument can be made for a symbolic exception in Brown’s case. . . . Justice would be served, belatedly, if President Obama and Governor Kaine found a way to pardon a man whose heroic effort to free four million enslaved blacks helped start the war that ended slavery. Today, one needed step in the antiracist cause is for all levels of U.S. education to offer courses that discuss the brave actions of antiracist activists like John Brown and Martin Delaney, and those many other, now nameless heroes who marched with them. And how about a major monument in Washington, DC to celebrate them and all the other abolitionist heroes? We have major monuments there to slaveholders, why not to those who died in trying to overthrow slavery?